Why Is The AWA Section So Important? If you aren’t new to the GRE format, you’d probably know that the GRE begins with the AWA section. But, most students underestimate its importance. Agreed; from the admissions point of view, a difference of 0.5 – 1 point on the AWA doesn’t make or break your chances of getting into your dream school. A 5.0 is almost as good as the 6.0. And unless you score below 4.0, you won’t be hurting your chances. But, the AWA is more than just a score. It holds a lot more importance than you think. No. We’re not talking about the importance of language or coherence or logic. But the importance of the first ever section that you are going to face on test day. Almost half of the GRE test takers every year are Native English speakers. And these students tend to neglect practicing the AWA section at home, because according to them, it’s not worth investing time on something they are very confident about. But, there are a few vital points that they don’t realize. We’ve observed what students do when they practice for the GRE, how their approaches have affected their scores on test day, and figured out four reasons as to why the AWA is an extremely important aspect of the GRE exam. This is the single most important thing to consider when we talk about the importance of the AWA section. Now, students normally tend to skip the AWA section when they take practice tests, so they can directly go to the first section of Math/Verbal. Though this might seem like the obvious choice to you, you should consider the aftereffects before jumping into conclusions. Think about it. The GRE is not a typical test that you encounter at college or elsewhere. It is a marathon. An intense, 3 hour 45 minute ride, which obviously you aren’t accustomed to. Now, if you skip the AWA section during practice, you’ll be forfeiting 60 minutes of the total test time, which means you are going to have to sit for 2 hours and 45 minutes only. This translates into an inflated overall score during practice, because you are just that much more active than you will be on test day. So, you get accustomed to sitting for 2 hours 45 minutes for the test, and your brain is hardwired to concentrate for that much time only. But, on test day, you still have two more sections to finish after you complete 2 hours and 45 minutes. Do you get the point? It’s that extra one hour of concentration that requires sudden attention from your brain, which it sadly isn’t ready for. This is exactly why thousands of students score very low on their last two to three sections. They simply aren’t ready for the extra time, because their brains feel tired already. So, if you don’t skip the AWA during practice, you’ll be writing in the exact test conditions as on test day, thereby training your brain for the big encounter. Despite what has been told above, if you are still very confident that the AWA is something you can ace with ease on test day, you are probably wasting time practicing it during practice tests. But how can you still train your brain to withstand the mental pressure while not tackling AWA at all? Simple. Decide the time when you want to take the practice test. Exactly an hour prior to the start of the test, start practicing tough quant or RC passage questions. Do these questions thoroughly, and don’t relax at all. Think of it as an exam, and keep doing random problems out of the Official Guide or Barron’s or any other material that you have. This will keep your mind occupied and stressed, just as it would be when tackling the AWA section on test day. This way, you are not only training your brain to withstand the mental pressure, but you are also buying the time off for some valuable practice. Since the AWA is the first thing you will see on test day, it is what makes or breaks your confidence. If you ace this section, it will be a confidence booster for the rest of the exam. You will definitely carry the momentum further into the test. But at the same time, if you don’t do well on this section, the momentum won’t be on your side. The added pressure and the worry that you haven’t done well until then, will have a massive effect on your performance thereon. Difficult to score a perfect 6.0.
only 1 percent of all students writing the GRE, score a perfect 6.0 on the AWA. Which is around 7000 of 700,000 students every year. This statistic alone shows how hard it is to get a perfect AWA score. And universities love students who score well in all the sections. They look for students who don’t leave any stone unturned. And it definitely doesn’t make a good impression on you if you have a great GRE score, but a paltry AWA score. So, it goes without saying that you will need lots of practice if you plan to score anywhere close to the perfect figure. Universities know the fact that most students take the help of consultancies and essay writing firms to help with their essays and Statements of Purpose. We too, do not encourage approaching consultancies, because then, your essays and SOPs don’t sound original. All they have are some basic templates that they tweak a little based on your profile, and send them away. But the universities compare your essays with your AWA score, and if your AWA score is 3.0, for example, but your essays sound brilliant, they understand that you haven’t sent the application on your own. This creates a very negative impression on you, which you don’t want to happen. So, make sure you practice thoroughly and score well on the AWA section. To sum it up, the AWA is still a part of the GRE test, and one shouldn’t ignore it or think of it as something that isn’t as important as the other sections. So, when you are practicing the test, make sure you are doing it right. After all, it would feel amazing to score in the top 1 percentile, wouldn’t it? 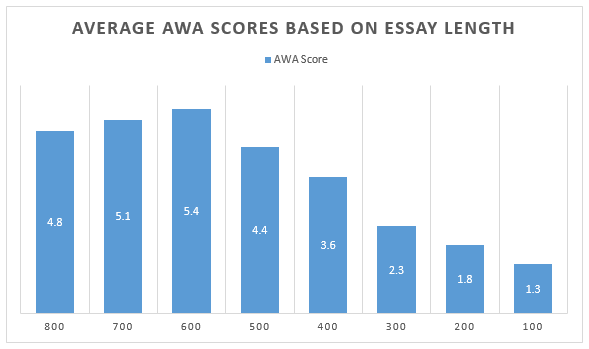 Each of your AWA essays is scored on a scale of 0 to 6. Two readers will read your Issue essay and assign it a deserving score and two different readers will read your Argument essay and assign it a score. Each grader will award a 6.0 to the top essays and scores of 0 are reserved for essays written on topics other than the one assigned or written in a foreign language. The graders spend about 30 seconds to 2 minutes on each essay, and give it a score based on pre-defined evaluation metrics such as the overall quality of your critical thinking and writing, as mentioned previously. The graders who evaluate the responses are college and university faculty members from various subject matter areas, including higher education. Once the readers finish grading your essay, the two scores will be averaged to arrive at a final AWA score. If the grades given by the two readers differ by more than a point, a third, highly experienced grader is brought in to resolve the discrepancy (i.e., determine your final score for that essay). For each essay, your final score is the average of the scores assigned by the two readers or the adjusted score assigned by the third reader. If you earned scores of 6 and 5 on the Analysis of an Issue, then your final score for the Issue essay would be the average of these two i.e., (6 + 5) /2 which equals to 5.5 and if you earned scores of 4 and 5 on the Analysis of an Argument, your final score on the Argument essay would be (4 + 5) /2 which equals to 4.5. Your final AWA score will be the average of your scores on Issue and Argument essays i.e., (5.5 + 4.5) /2 which equals to 5, which will be your final AWA score. It should be noted that though your AWA scores range from 0 – 6, about 90 percent of all scores fall between 2 and 5. The average score for the AWA section for all the test takers so far is around 4.2. Your Analytical Writing Assessment scores are computed and reported separately from the multiple-choice sections of the test and have no effect on your Verbal, Quantitative, or Total scores. Your score report however will not include copies of your responses; only scores are sent. You will receive your essay scores approximately 10-15 days after your test date. When individuals attain greatness, their achievements are more important than their personal faults. While historians should not whitewash the personal foibles of great individuals, the impact that these mortals have had in their fields should tower over any personality defects. To focus on the personal weaknesses of great individuals is to miss the importance of their achievements. The course of human history is decorated with individuals able to rise above their peers and reach the zenith in their fields. These individuals are often the subject of intense scrutiny from contemporaneous skeptics and later historians. But no one can lead an exemplary private life all the time; no human being is able to withstand such surveillance and historical scrutiny without personal faults coming to light. Great individuals are no exception. However, it is misguided to focus on their personal faults rather than their achievements. To do so is to miss the importance of their work, without which our culture would be worse off. For example, Abraham Lincoln was arguably one of the greatest Presidents the United States has ever had. He managed to bring the country through a substantial revolution and to end slavery despite powerful economic and social forces working against him day and night. However, Lincoln was not a saint. He was moody and prone to depressive funks that disrupted his family life and slowly eroded his marriage. These personal faults did not reduce his success as a President. While we do not have to ignore questions about whether he was a depressive, we also should not consider them an important part of his political heritage. In contrast, many people criticize Lincoln’s decision to suspend the right of habeas corpus. This (presumed) failing is not personal in nature, but relates directly to Lincoln’s work in his field. Criticisms of this sort are entirely relevant, whereas personal criticisms are not. Another example of a great individual dogged by criticism of his personal conduct is Albert Einstein. Einstein developed a number of the most important theories in modern physics, including an explanation of the photoelectric effect, an explanation of Brownian motion, special and general relativity, and Bose-Einstein quantum statistics. Each one of these theories would have been considered a great life’s work for a scientist; for one man to contribute this much is remarkable. However, Einstein also had life-long problems with infidelity. The fact that he cheated on his wife is in no way relevant to his accomplishments in the field of physics, and indeed most references to Einstein properly ignore it. To focus attention on the faults of his personal life is to obscure the impact he made on history. Great individuals have personal faults, as all human beings do. Yet it is incorrect to assert that these faults detract from those individuals’ accomplishments. We are better able to appreciate the gravity of great accomplishments when we are not burying our heads in the sand, in search of personal failings. The essay above deserves a perfect score, because it takes all the 7 major elements that graders look for, as we have already discussed in chapter 3: Clarity, Structure, Sentence Variety, Vocabulary, Grammar, Evidence, and Reasoning. The thesis provided by the student is very clear and concise. There is no confusion about which side the student took. The issue essay tests how well we can present a position on an issue effectively and persuasively, and this essay passes both the tests. The piece is also very well organized. The most popularly used structure “intro-body-body-body-conclusion” really works well for this type of an issue, and the student made good use of it. While the response included only two examples as opposed to the suggested three, the two examples presented are extremely strong. President Lincoln is an ideal case study of a leader whose greatness should be not be obscured by his domestic problems. The same can be said with Einstein; his infidelities may have wounded his family emotionally, but his contribution to modern science and technology will be remembered throughout the history of mankind. So, obviously, two of the most historic and the most apt examples were presented by the student here. Additionally, the conclusion is substantial and does an excellent job of summing up the essay. The student uses a variety of sentences in order to make the conclusion unique, and not sounding too much like the introduction itself. He/She does a great job of restating the introduction paragraph without sounding overly redundant. Lastly, this essay is extremely well-written, and shows the student’s grasp over written English language. The grammar and syntax are almost flawless, and it is hard to write a better essay response to this issue, in under 30 minutes. These are the reasons why this essay deserves a straight 6.0 score. Discuss how well reasoned you find this argument. Point out flaws in the argument’s logic and analyze the argument’s underlying assumptions. In addition, evaluate how supporting evidence is used and what evidence might counter the argument’s conclusion. You may also discuss what additional evidence could be used to strengthen the argument or what changes would make the argument more logically sound. The argument claims that the electronic games rating system, although similar to the movie rating system, is not working because it is self-regulated and violation fines are nominal; Hence, the gaming rating system should be overseen by an independent body. Stated in this way the argument fails to mention several key factors, on the basis of which it could be evaluated. The conclusion relies on assumptions, for which there is no clear evidence. Therefore, the argument is rather weak, unconvincing, and has several flaws. First, the argument readily assumes that because the electronic game rating system is self-regulated, it is not working well. This statement is a stretch and not substantiated in any way. There are numerous examples in other areas of business or commerce, where the entities are self-regulated and rather successful. For instance, FIA, the Formula1 racing organization is self-regulated. Yet, the sport is very popular and successful, drawing millions of spectators around the world each year. Tickets are rather expensive, races are shown on pay-per-view, and nearly all drivers are paid very well. Another example is the paralleled movie rating system that the argument mentions. The author fails to clarify whether it is working well, but it is clear that the movie rating system is pretty well received by people, who often base their decisions to go see a movie with kids or not on the movie rating. It has never been a case when someone would feel cheated by the movie rating and express disappointment afterwards. Since the movie rating system is also self-regulated, it follows that this regulatory method is working pretty well and it is not obvious how it can be the reason for the poor electronic game rating system. The argument would have been much clearer if it explicitly gave examples of how the self-regulatory system led to bad ratings and customer dissatisfaction. Second, the argument claims that any violation fees for bad electronic game ratings are nominal. It thus suggests that this is yet another reason for the rating system not working. This is again a very weak and unsupported claim as the argument does not demonstrate any correlation between the monetary amount of the fines and the quality of the electronic game rating system. In fact, the argument does not even draw a parallel with the mentioned movie rating system and its violation fines. If any such correlation had been shown for the movie rating system, which supposedly works well, then the author would have sounded a bit more convincing. In addition, if the argument provided evidence that low violation fines lead to electronic game manufacturers to ignore any regulations with respect to the game rating system, the argument could have been strengthened even further. Finally, the argument concludes that an independent body should oversee the game industry and companies that violate the rating system, should be punished. From this statement again, it is not at all clear how an independent regulatory body can do a better job than a self-regulated one. Without supporting evidence and examples from other businesses where independent regulatory bodies have done a great job, one is left with the impression that the claim is more of a wishful thinking rather than substantive evidence. As a result, this conclusion has no legs to stand on. In summary, the argument is flawed and therefore unconvincing. It could be considerably strengthened if the author clearly mentioned all the relevant facts. In order to assess the merits of a certain situation, it is essential to have full knowledge of all contributing factors. The piece is also very well organized. The most popularly used structure “intro-body-body-body-conclusion” really works well for this type of an argument, and the student made good use of it. The response included sufficient examples that are pretty solid, and more than satisfy the student’s take. The examples provided are also real-life in nature, as opposed to many hypothetical examples that students write. This gives this essay response quite an edge. The student uses a variety of sentences in order to make his/her point strong enough to concur with. He/she does a great job of restating the introduction paragraph without sounding overly redundant. All the paragraphs are very well written, and the structure, writing, and vocabulary used by the student shows the student’s grasp over written English language. The grammar and syntax are almost flawless, and it is hard to write a better essay response to this issue, in under 30 minutes. Believe it or not, one of the most frequent questions that we receive from students around the world, is how they can get their essays graded. That is a good question, actually. Given the fact that there are so many practice tests for the GRE where you get your Math and Verbal sections graded, there is not even one practice test in the entire world that can grade your AWA score for you. If you are wondering why, it is because it is not at all easy to grade your essay instantaneously. Think about it. Even on the test day, you will only receive your Math and Verbal scores, but not the AWA score. ETS itself takes about 7-10 days to give you an official report of your AWA score. It is that difficult to assess an essay. Plus, it is required that a human grader reads and grades your essays, if you want an accurate score. Which is obviously impossible if you are taking a practice test at home. So what can one do? Is there no way to get your AWA essays graded? Well thankfully, there are quite a few options that you can consider. We’ve listed down all the available options, and it is up to you to decide which of them you want to choose. The ETS Score It Now, is a great feature available for you to get your essays graded. For a small amount of $13 dollars, the ETS Essay Grader will grade two of your essays. You can submit any two of your essay responses, and the software will get back to you with a graded score of your AWA. Now, for most students around the world, and especially for those from the developing world, $13 is quite a lot of money. And that is probably the reason why most students don’t even know that such a facility is available. We must agree, that even we at CrunchPrep have never used the service ourselves, or know any student who has, simply because we did not need to. Our expert tutors, on the other hand, have been grading student essays for free for a long time now. But nevertheless, we’re pretty sure that the ETS Score It Now feature will get you an accurate score, because well, it’s ETS who developed it. And there is one more downside with this feature. The score is all you get, when you submit your essays. No feedback. Now, you would expect that ETS would give you some valuable tips to improve your score, but unfortunately, that $13 you spend is only going to get you a couple of numbers from ETS. So, unless you don’t need feedback, you are really not improving on the essay, and you have money to spend, you should definitely try and consider some other alternatives to this service offered by ETS. Yes. However unbelievable it might seem, your friends can sometimes help you get better marks. They can help you identify the mistakes you did not find obvious enough, and you also get an outsider’s opinion on your essays, and therefore on your points of view. Now, even though your friends might be untrained, or unaware of the GRE AWA grading system, having a second pair of eyes look at your writing can be really beneficial to finding your flaws. Plus, you receive feedback then and there, right on your face, and it is sometimes the easier way to learn. But before you let your friends or family judge your essays, you should tell them beforehand that you only had 30 minutes to write your essay, and so they should not expect you to write an award-winning piece. You should also tell them to pay attention to, and then judge you on the following aspects of your essay: structure, logical flow of ideas, and persuasiveness of examples. They should ideally not be looking for impressive words or sentence framing, but it is just an added bonus. If however, you are too shy to ask your friends or family, try asking an experienced professor at your college, preferably a professor in linguistics or someone who is really good at formal, written English language. These professors not only give you an accurate assessment of your essays, but will also give you valuable insights as to where exactly you can improve your writing skills. When you don’t have access any professors or wise friends who can help you evaluate your AWA essays, the best option you are left with, is you. Self-evaluation, though most of the time not recommended, can be a really useful option for you. There are hundreds of mock essays on the internet, and with a simple google search, you can get access to various essays for the GRE. Even the ETS website has a few sample answers for essays, and the same questions have sample answers which are purposefully written to mirror a 6.0, or a 5.0 level essay, for example. So, if you can compare your response with those on the internet, you can roughly estimate whether your answer is closer to the 4.0 or the 5.0 sample. If you can do this a lot of times, you will begin to see a definite pattern, which can help you estimate your average AWA score. Also, most mock essays usually have an explanation at the end, which explain why they have been given their respective scores. This really helps you see if your essay is lacking in similar ways. This sounds rather difficult, and it actually a really complex and time taking process, which is why you should try and take this approach as a last measure; if you cannot find any other alternative helpful enough. If you are an internet geek, you would probably agree that sometimes, internet strangers are really helpful in nature. There are many GRE forums like Urch, PaGaLGuY, etc, where you will find hundreds, if not thousands, of GRE experts and aspirants, who wouldn’t mind lending a hand. Thousands of GRE aspirants visit these forums every single day, and if you can post your essay and ask for some feedback, more often than not, someone will provide you with the necessary assistance. While this someone may or may not be an expert, it often helps to have a second opinion from someone in your niche. Alright. We’ve saved the best for the last. GMATAWA.com is probably the most fantastic resource out there, when it comes to grading your essays. It was developed to grade GMAT AWA essays, but rest assured, there’s not much difference between GMAT and GRE AWA essays. The basic structure of essays is the same everywhere, and this website is really helpful in grading your essays. The grading happens instantaneously, and as soon as you submit your essay, you will receive a composite AWA score, along with various metrics on which your essay has been graded. We, at CrunchPrep, assure you that, other than ETS Score It Now, this is probably the most accurate AWA rater you will see, and you can expect a similar AWA score on your exam as well. So, make full use of this feature, and assess your writing strengths and weaknesses. However, you should remember that the website allows you to grade only 10 essays per email address, so choose wisely which essays you will be sending. So, those are the five ways that you can get your AWA scores graded. Most often, more than one of the resources mentioned above will definitely be helpful to you. And even if none of them works well for you, we are here to help you with essay grading. Just send us an email, and we will grade your essays for free. And by the way, remember this: Only two things can make you a better writer – Practice, and Feedback. The essay graders are aware that you only get 30 minutes to write each AWA essay and they also know that you won’t be able to cover every possible argument, reason and rebuttal. Hence they do not expect you to write a super long detailed analysis of the issue or argument given to you. Remember that most GRE test takers won’t be able to find time to cover everything they would like to cover on the test. So, how long should your AWA essay be? We see students wondering about this all the time and we know you would like to know about it too. ETS has not spoken out about the ideal length of an essay, and there is no word on the word limit as such. But there seems to be a pattern that appears on GRE sample essays that come along with the ETS official guide to the GRE. When closely observed, there is a significant increase in the number of words from a 5.0 graded essay and a 6.0 graded essay. The reality is, longer essay is usually better. To analyze further on this topic, we have done a bit of research, and found out an interesting relation between essay length and the final score. If you look at the statistics below, you will have to concur with me. longer essays usually score better on every essay topic. If you are a long-essay fan and insist to pen a high scoring AWA essay on the GRE, you should write anywhere between 500-600 words. Don’t ask us why. The research shows that’s how it is, and if it true for a sample of 500 students, it must be true on a larger scale as well. A column chart with average word count for essays from 500 students. If you’d like to know more about the GRE essay length, we’ve done a separate post on that. Go check it out now. The difference between a normal essay and a great essay, is the way it is written. Normal essays are lifeless, and they bore readers a few lines into the story. But on the other hand, great essays meticulously use persuasive language, and gain the reader’s attention. In addition to writing compelling reasons and connecting stories, you should also include powerful vocabulary, if you want to get a perfect score. Since a lot of students who take the GRE are non-native speakers, they will not be able to naturally write essays that sound truly professional. So, here are some of the words and phrases you should be using when you write your AWA essays. You might have seen these words countless times in books, newspapers, or magazines. But it is time for you to include them in your writings, and make your essays sound professional. Ultimately, it is the content of the essay that really matters. If you are able to write an astounding essay, you really don’t need any advanced words or phrases. But since it is a herculean task for many students, especially the non-native students, to write a perfectly professional essay in under 30 minutes, it would definitely help if some of these words are included. But at the same time, students should be careful enough to not simply scatter these words across the essay as they please. These words and phrases should really fit in the context of the essay, and the sentences must smoothly integrate into one another. Hence, refrain from using these words and phrases improperly, and learn when and where to use them in your AWA essay. So, that’s about it. We have come to an end of this epic guide to ace the analytical writing section on the GRE. We have discussed some invaluable strategies that you could use to improve your writing skills, and thereby get a perfect score on the AWA section.